The past few days have been a mix of oppressive heat and violent thunderstorms, with me conducting various errands in between, and working on art from home. Yesterday I brought the newly colored second proof of this cats image to the Boatworks so that I could compare it to the one hanging on the wall to see how well it matched. The inner pinkish ear of Romeo (black cat) was too light, but otherwise it was pretty close to the first one. 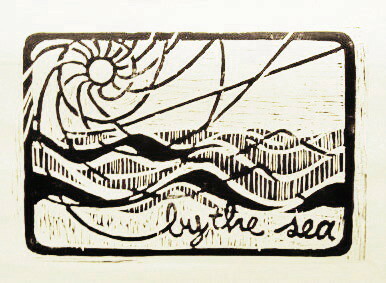 Also took care of some other business relating to my upcoming woodcut class there. Fixed the ear later in the evening. Today I went through the process of mounting the print. First glue the paper to the wood block. After that was thoroughly dry, trim the paper, then glaze it all with a glue wash. Still needs the wiring on the back, but I'll deal with that tomorrow morning before I drop it off. Back to the Studio today for a few hours. First, I taped a recently printed copy of my St Genevieve print to a drawing board for eventual coloring. 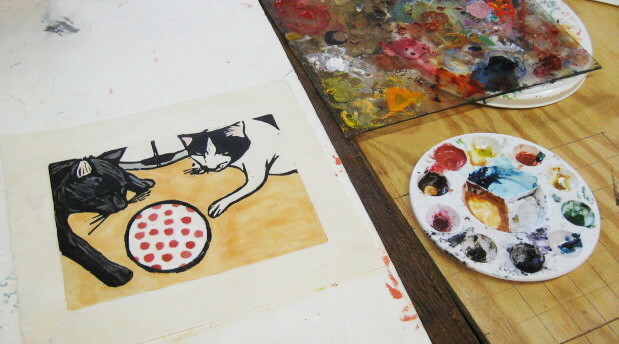 But mostly I was coloring another proof of my print with the two cats. 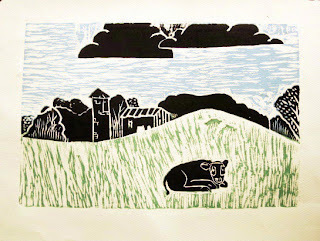 This is the one left over from the printing session prior to the Animal Spirits show, not the ones printed yesterday. Brought it home when I was done, since everything else needed to put it together is there. Yesterday's prints remain in the rack to dry for at least a few more days. I spent a bit of time earlier this month quickly producing my new Animal Spirits print- a few days to draw and cut the block, and a few days coloring prints to get my final version. I'm happy with the results, and it got a very good response at the exhibition intake, the reception, and from people I've seen since. But not knowing how it would go over, as a back up I printed a couple of proofs of my cats block (created for the international postcard show), and lacking a frame that size, went with the glue it to a block of wood process that Molly favors and that I used for the Time to Downsize print. Didn't get as many comments, but it did get purchased at the reception, which has to count for something. I stopped by the Boatworks on some other business late last week and was informed that someone taking a class that week expressed disappointment at not being able to buy the cats piece herself. However, she was informed that it was a print and thus more copies could be available, and I was advised to crank out another one soon. Last time I printed this I made two proofs. The coloring worked out on the first, so I left the second alone. I'll try coloring that one sometime this week, but meanwhile I had other things to work on. I had one last significant piece of the pine board I used for the cats in the show and the two copies of the house print that I had made. I used the power saw (above) to cut off a piece of identical size to the one currently hanging in the Boatworks, and then sanded it smooth. Next, I decided it would be a logical precaution to make a few more proofs in case there was a problem coloring the spare one I have. Got another scrap of okawara and tore it in half to make two pieces of the right size. Last time, with an imminent deadline, I added a little drier to the ink, but this time I used it as it comes out of the can. Although my family members have been finding issue with the ball shape (size and coloring pattern), if someone wanted to buy what they saw on the wall, this isn't the time to make changes, so I used one of the same size plastic cups to print the circle in about the same place on both. For now I left both proofs in the rack to dry. In the next few days I'll get back up to the Studio and color the one I have ready to go, and if it turns out ok, mount it to the piece of wood. If there's a problem coloring that one, I'll have two more back ups. 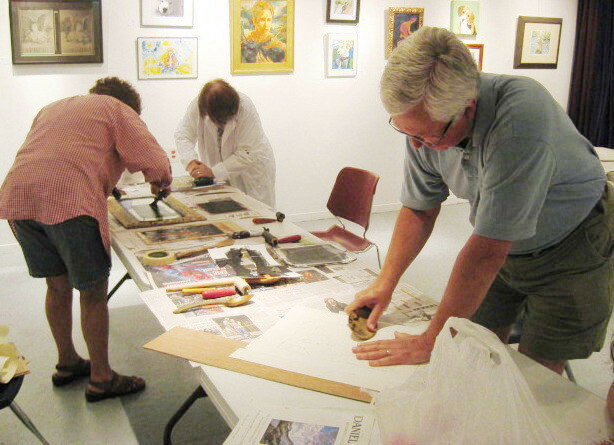 Tonight was the fourth and last scheduled meeting of the latest round of woodcut classes at the Belmar Arts Council. All four participants were there before 7 pm, which allowed me to take a few minutes to discuss some business and offer a few bits of general advice. After that they jumped into action. This is a very motivated group. 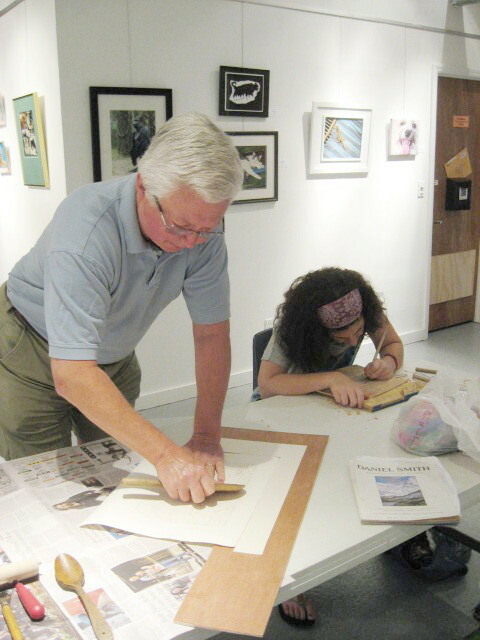 They're making their own bench hooks, buying their own tools, finding their own wood. Everyone had new blocks since last week and was ready to print. I handed out supplies and gave some advice here and there, but mostly I just stayed out of their way. I decided to dig up my old painting palette, shown in the lower right of the above photo, to provide more inking opportunities in our limited time. We needed it, as we had three people simultaneously inking and/or printing most of the time. Some of the prints tonight were rough first proofs of new blocks, and those blocks are expected to be recut before long. 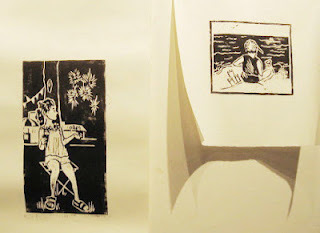 Below are two finished pieces from today's session- Stan's three color print with the black added, and a better proof of one of Jill's prints from last week. All four member of this class tell me they'd like to continue and take another round of classes. There's plenty more to be learned, so I'll discuss this with the appropriate people at the BAC. 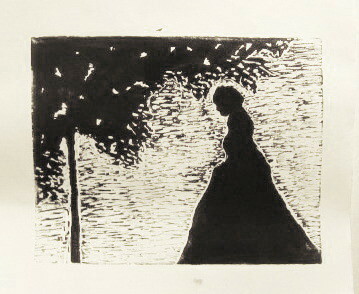 And I have heard from others who tell me they want to start learning woodcut. I may need to buy a lot more tools and supplies real soon. Other than some drop off/pick up and photo sessions, haven't been in the Studio for about a week. One of the things occupying my time in recent days was putting together my application for the latest round of NJSCA Fellowships. I've done this six or seven times since the mid 1990's, with no luck so far. In fact, last time they cancelled the program less than two weeks after everything was submitted, so I have no way of knowing if this effort will lead to anything. But it doesn't cost me anything either, and the internet application process is relatively easy. So last night I submitted the online portion and today I mailed in the signed hard copy form. If this round of fellowships does actually come about, I'll learn the results in February. 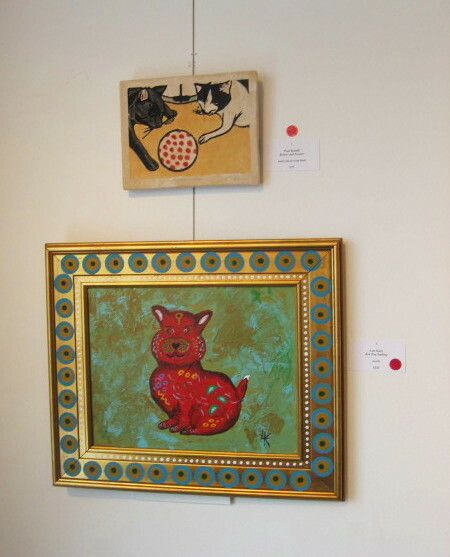 Today was the opening reception for the Animal Spirits show at the Belmar Arts Council. I had seen the show mostly up on the walls earlier in the week, but now the last pieces were installed and the labels on the wall. The print that I completed specially for this show (above center) was popular with many who liked my unusual take on the theme, though not popular enough to be one of the pieces chosen for a prize by the voters there today. However, it wasn't a total loss. 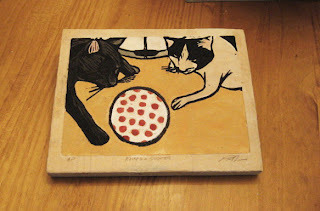 My second piece, a reprinting of my cats block below, also won no award, but it did sell, as evidenced by the red dot next to it. 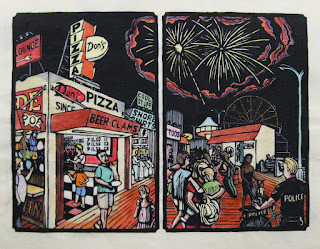 The show remains up at the Boatworks through August 17th. See the BAC website for details. My woodcut workshop took a mid semester break last week, so as to avoid potential conflicts with the holiday week. All four of my students returned tonight to continue learning about woodcut. Everyone took advantage of the two weeks off to get a lot of work done, some even finding wood on their own to complete a second block. As a result, the focus tonight was on printing. 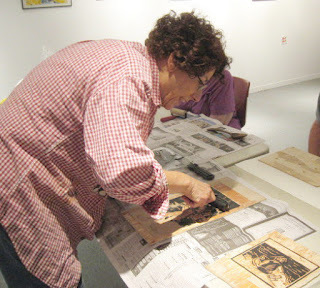 Above, Jill inks her second block. Below, Kate lifts the paper to check the progress of her printing. 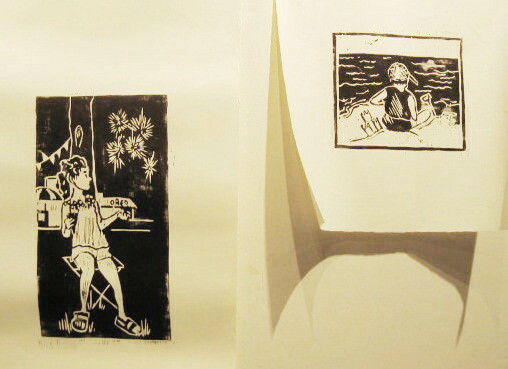 Stan had carved a second copy of his image and pulled a rough proof with some black ink, but tonight he wanted to try working with color, so we used a registration system and his original block to print the first two colors of what will be a three color print. Below are the first proofs from tonight's printing. Next week is the final session. Everyone took home a new piece of wood tonight, so we may see some new prints next week, as well as updated versions of these. The past few weeks have been rough for much of the country in terms of weather. Here in the northeast we've had multiple heat waves, with last week a long run of humidity and temperatures topping out at or near 100 degrees many days. Our basement Studio was tolerable most days, but walking around outside for any length of time was a challenge. 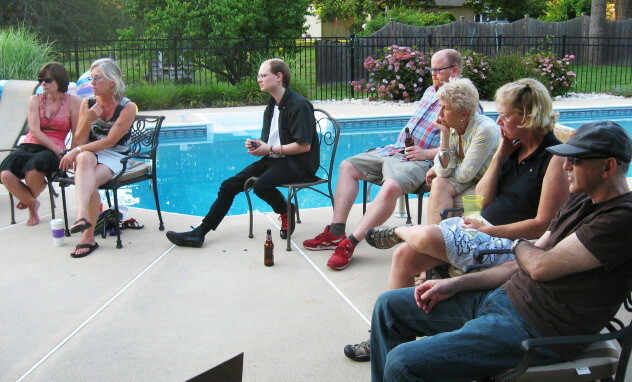 So a few days ago, the idea of having our critique outdoors would have been crazy. However, the heat and humidity have dropped over the past few days and should stay that way a while, just in time for our annual poolside critique. We had 7 regulars show up, plus Mary our host. 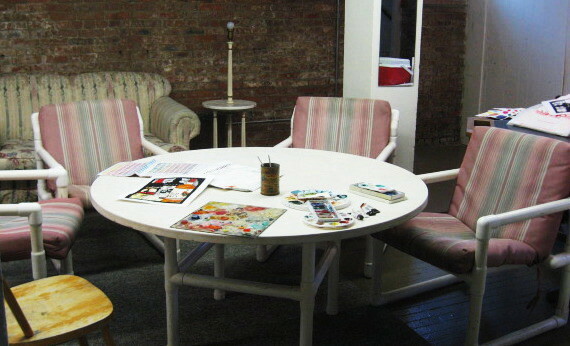 We relaxed with a little food and drink up front, then moved our chairs over to take in the art. Our first wave of art included Jill's painting (a reworking of one of her recent Doris photo collages), and the two most recent prints that I finished since our last crit- St Genevieve and Animal Spirits. On the right is something unusual. 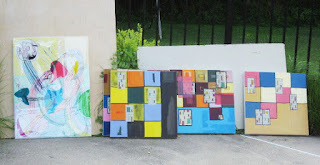 Instead of her own work, Edy brought us some examples of art from a friend of a friend. In this case the artist couldn't join us, as he's on death row (with hopes of changing that), but he's now a self taught artist, and we were being asked to provide advice regarding the work done so far. 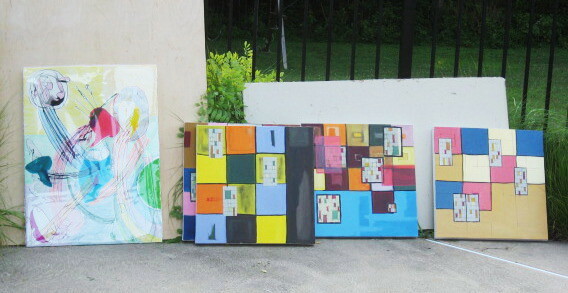 Tim brought his latest mixed media abstraction, and Vince had more of his grid pieces- some new, some evolved versions of ones he brought last time. 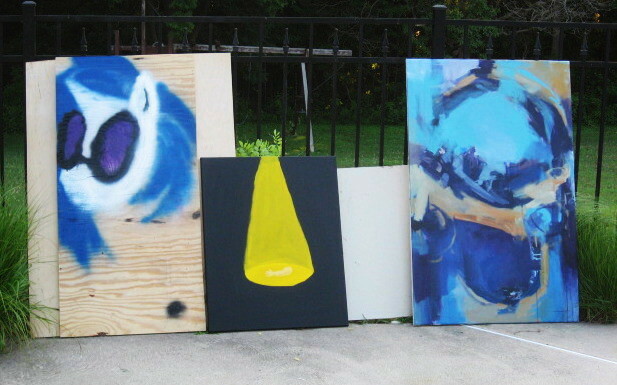 TJ brought in a few recent paintings in progress. Sandy tells us her abstraction on the right is also not quite finished yet, though all of us present thought it's pretty good. We had started a little earlier than usual, so we were done by about 8 pm, but we still had plenty of daylight and ended up hanging around for another hour talking about various art related stuff. Don't know what the weather will bring next month, but we'll be back indoors in our usual spot. This morning I took the last steps to get my pieces ready for the BAC Animal Spirits show. Getting the bottles image ready was pretty easy. I had cut a window mat during the week, so it was just a matter of opening a framed work, mounting yesterday's colored proof on a backing board, and putting it all together. Maybe 3 minutes worth of effort, spread out over the time it took for the tape to dry. For the image with the cats, I had glued the print down to a cut piece of pine last night. This morning I trimmed the print to the edges of the block. Because it's mostly big shapes of solid color, instead of using the spray acrylic like I did for the house prints, this time I just made a wash of PVA and brushed it over each part of the image, and the margin. It would dry quickly and without the harsh solvent smell that sprayed objects emit for several hours. Some wood screws and a bit of wire completed the job. 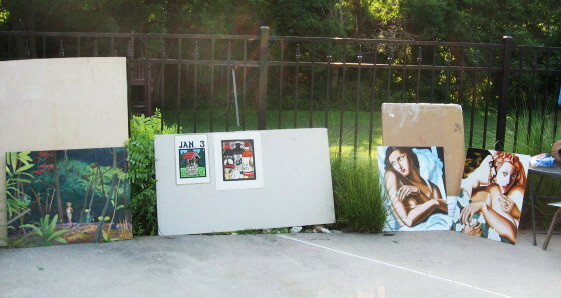 I dropped off both pieces at the Boatworks shortly after noon. A few pieces came in after mine, bringing the total for the show up to around 60 works. This is a benefit for the Humane Society, not a juried show, so my pieces will both be in the show. The intake committee really liked the image with the bottles- I imagine that a lot of images of cute and fuzzy animals came in, and that piece is definitely different. There will be an opening reception for the Animal Spirits exhibition at the Boatworks next Saturday, July 14, from 2 to 4 pm. There is a plan to have animals available for adoption at the reception. 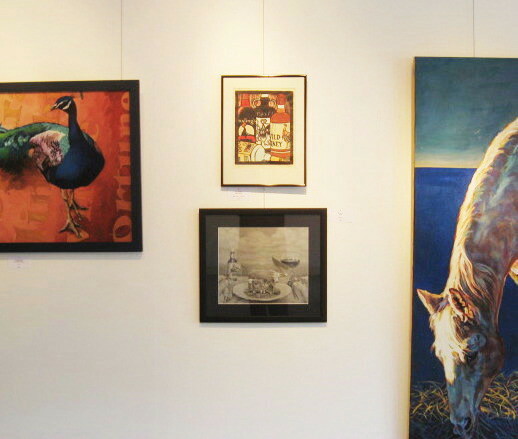 The show will remain on display through August 17, 2012. Before going into the Studio this morning I gave some more thought to that bottle reflection. Molly had mentioned yesterday that she liked the idea of it being very light, maybe even white, but I thought it would be too big a spot to be the only pure white in the whole composition. Using cut paper pieces I had considered a pale blue (like the clear glass seen elsewhere) or a very pale yellow, but hadn't made up my mind yet. Took an early morning trip to my local supermarket on another errand, but paused to look at glass bottles to see reflections, but mostly I saw just single white lines, probably from overhead fluorescent bulbs. Back home I looked at a dark wine bottle and saw lines again (this time from around window shades) within slightly lightened mass more like the shape I had cut out. That would be my solution- a light color within a darker color. The last proof was on a piece of okawara, the Japanese paper I've been using for all the boardwalk prints. Tricky to color but I've had a lot of practice with it over the past few years. The softest, thinnest, and darkest of the papers I printed this image on, the paper would have an effect on the color, for good and bad. I just followed what I had done for all of the 3rd proof, except for that reflection on the shoulder of the bottle on the left. I went with a thin stripe of yellow, shifting to red, then to dark brown, all colors found in other parts of the print. Results can be seen above. Molly was in and she also liked the decision. She and I took a break for lunch at the invitation of our landlord, who had all the building tenants in for sandwiches, meatballs, chips, and cake. We also took a timeout to crate a full grown tiger, but that's another story. 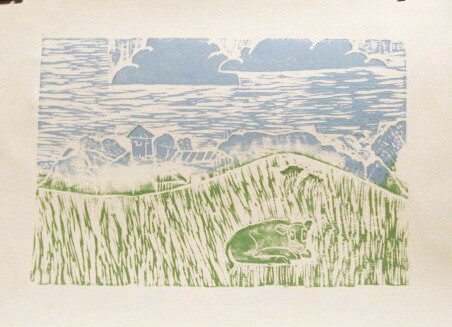 I still have one other animal spirit print- the cats. Back home I did the coloring for that one. Kept the cats the original colors. Considered the tile checkerboard pattern again, but instead just went with a single color, and made the ball a large version of one of Scooter's favorites. The plan is to mount this directly on wood, like the house shaped print from this past spring. If it works, I'll submit both to the show tomorrow. Holiday over, and back to work. I thought that the 2nd proof (done Tuesday) was moving in the right direction, but not quite there. Today I colored the 3rd proof. A few significant differences from the others that had nothing to do with color choices- this one is on a softer paper with a warmer overall tone (not the slick bright white paper of the first two), and this one has the additional cut sections. As for the color, except for the new cut section at the top, the center bottle is pretty much the same. The whiskey bottle on the right maintains the same colors, but just darker. Same with the tequila bottle, a deeper naples yellow on the label. The rum bottle on the left is also very much the same, except this one has the curved reflection on the left side shoulder. Based on the online photos I had looked at, I gave it the dark brownish color seen above. Accurate perhaps, but not very exciting. 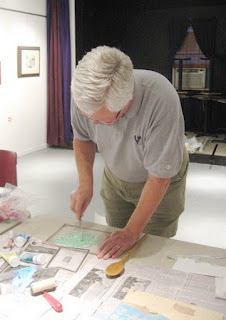 I'm going to play with some cut paper pieces of different colors, see what some other options look like. I have one more proof to color tomorrow, and between this one and that one, I'll choose one to submit to the show. Not that I'm going to the Studio today. I'll spend most of the day hiding from the oppressive East Coast heat inside my air conditioned apartment, enjoying the annual Twilight Zone marathon. I'll enjoy the day off from art making, and jump back into it tomorrow. With my Studio a construction zone this morning (power tools, dust, hot air from outside) I decided to bring a bunch of stuff down the hall to the generally vacant cafeteria and do some coloring on location. (last time I worked on art here was when I started my smoking figure a couple of years ago) I had made notes at home last night, comparing the first colored proof to my source photos, and used those notes today. Results are below. Once again this is one the first state proofs, so lacking the block changes from yesterday, but those will have minor effects on the color. One obvious difference is that this time I put in a background color, a wash of deep red. The bottle on the left is pretty much the same, just a different form of red on the very top. That may change again before the final version. The middle bottle has a darker gray in the shadow areas, but is otherwise about the same. 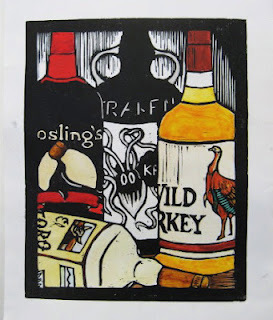 For the whiskey bottle I made some slight changes to the turkey colors, just different shades of those I used before. The whiskey itself was changed from a deep yellow to an orange-brown. Much better than yesterday, though I think it could get darker still. The label on the tequila bottle is pretty much the same, but I changed the top to a lighter color, and gave the glass area a cooler tone (as if clear liquid or empty glass) which makes more sense and broke up a big mass of light warm tones in that area. I don't think I'm quite there yet, but I'm close. I took it home to consider for the next few days. The remaining proofs are on different papers, both warmer and more absorbent, which will also have an effect on every color, perhaps unify them a bit. 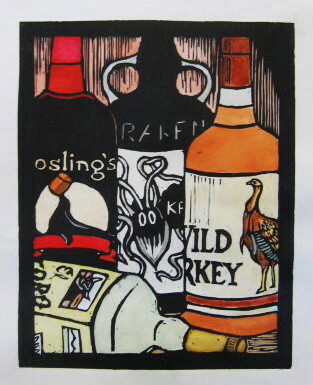 Whatever happens with the bottles, I still have another animals spirit print option- the cats. 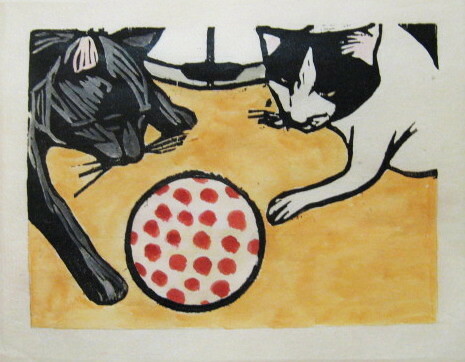 The original print (the collaborative postcard) had the cats surrounding the tea bags provided by the other artist, but that's not part of this. Both cats will play with toys from time to time, and the simplest of those to make is a ball. 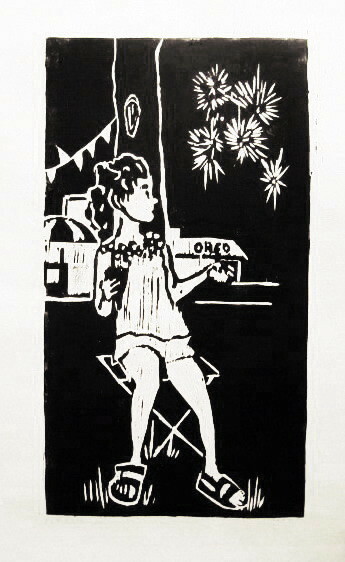 Because of the impending deadline, I added a little drier to the ink I used in yesterday's prints. I don't like to mix altered ink back into the can, so I saved it in a wax paper packet, which will work for a few days at least. 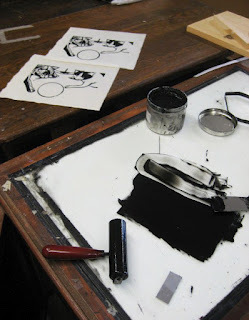 When the window installer was on lunch, I quickly went back to the Studio to do some printing. 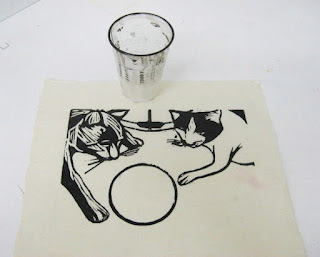 I took out the two proofs, opened my packet of ink, and carefully dipped the open end of a plastic cup (leftover from my students' ink wash drawings) into the ink, then pressed it in place between the cats, as seen above. The ink should be dry by Thursday, at which time I can color these proofs as a possible submission to the show on the weekend. 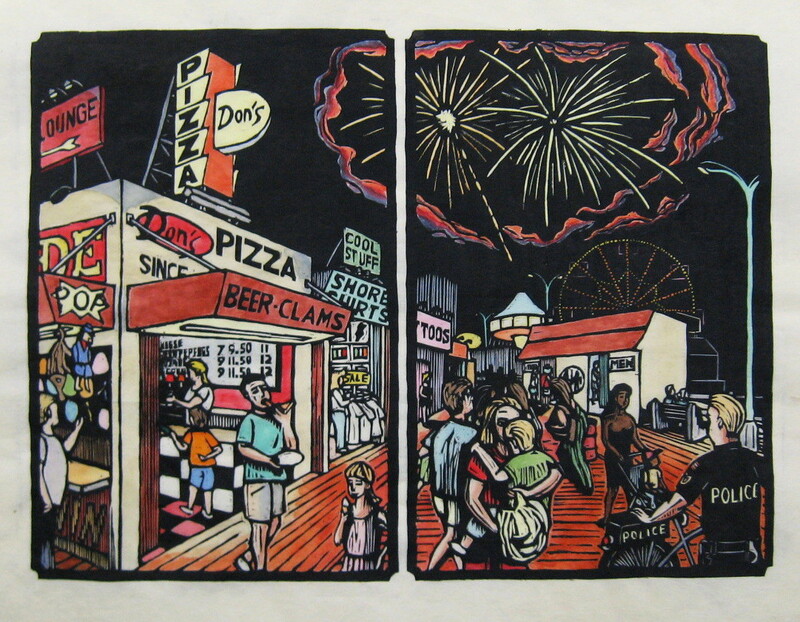 In the spring of 2006, Molly and I decided to move into our Studio space, in the basement of the Jersey Shore Arts Center in Ocean Grove. For those interested, back then it looked like this. 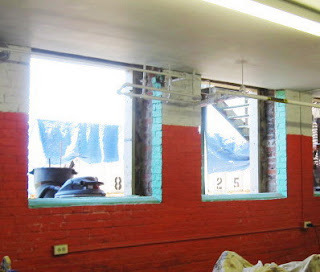 At that time, the building's owner told us he was planning to replace the bank of windows in our space, which then faced into a courtyard space contained by the schools's mid--20th century annex. A lot of stuff happened since then (the annex was torn down a few years ago), but our windows remained unchanged. However, people had been coming around in recent weeks to measure things and we were told it was going to happen. Other basement windows were replaced yesterday, so we knew it was coming soon. When I arrived today in the late morning, I found all four windows (two opaque windows, two boarded up spaces) were gone. Revealed was a whole lot of light, as well as the core construction of the exterior wall. I relocated some work materials to the cafeteria, but checked progress once in a while. By early afternoon the new windows were in place and some insulation and caulking filling some of the gaps. Below is how things looked by the end of the afternoon. Still more work to go with the process, as a different contractor will be involved in filling up the spaces lining the window opening, and creating sills. And some shades/blinds will be very helpful for some of what we do there, but for now we have a whole lot more light than the room has seen in a long time. I stopped by the Studio this past Saturday, just to pick up a few things. Molly was in working on a few projects. 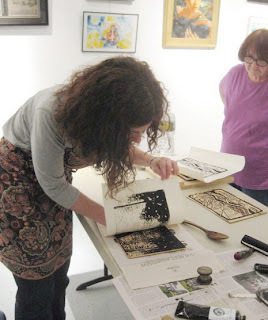 She had seen me inking the new block the day before, but on Saturday she saw the print for the first time. She still liked it, but brought up one possible small issue. 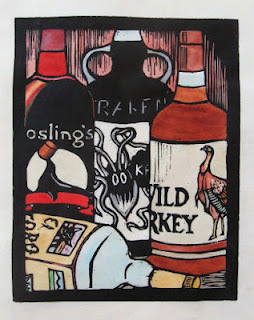 She was able to understand the relationship of the bottles to each other, but thought the large black bottle on the left blended in too much with the black frame adjacent to it. As a result, it could confuse the space a little. I saw her point. 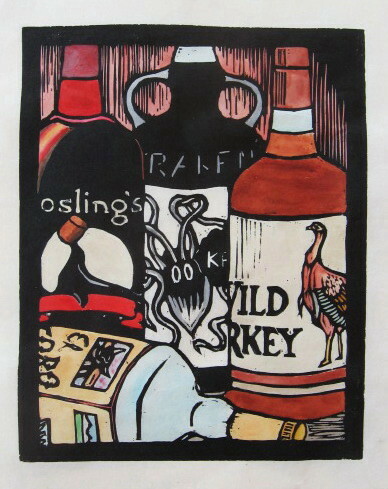 The frame at the bottom of the image (see above) is clearly in front of the reclining tequila bottle, which is clearly in front of the rum ("osling's") bottle, but the mass of black on the latter joins it to the same frame, pulling it forward. 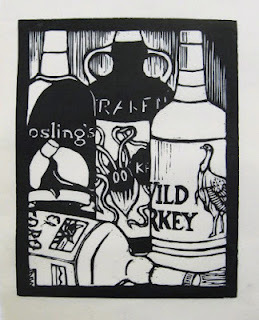 I'm pretty sure that most viewers would still understand the relative spacing of the bottles, but I'd rather the frame not be something to forces itself to be part of the still life. I brought a proof home to look at and considered a few possible fixes. I could have cut out all above the lettering, and colored it to look like very dark rum, but I thought that would make the composition too symmetrical. I looked at online photo references of the particular bottle and found many had reflection patterns curving down one or two sides. I cut out a piece of white paper in the shape of the reflection on the side and placed it along the edge of the frame. It certainly stood out more, and I didn't think that it hurt the image. I also spent time over the weekend looking at my source photos again and noting all the specific colors, and which paints that I had would best duplicate them. Today I got to the Studio in the late morning, and again Molly was there, working on a t-shirt order. 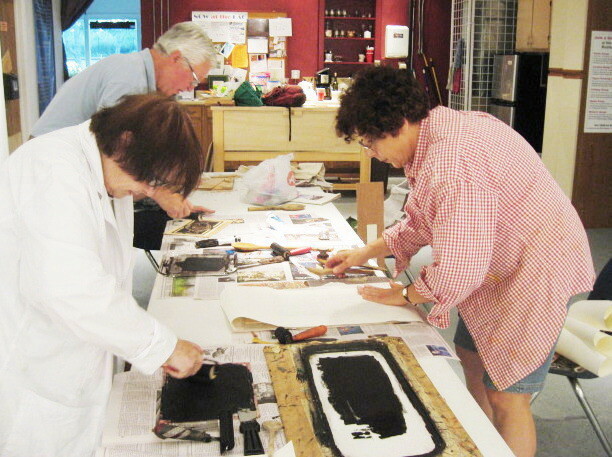 My first task was to prepare pieces of three different kinds of paper, for the proofs I was planning to pull today. (best to tear down paper while hands are still clean) First thing I did was pull a new copy of the St Genevieve print, which I will eventually color and give to her parents. Used the same Rives Lightweight that all saints are on. 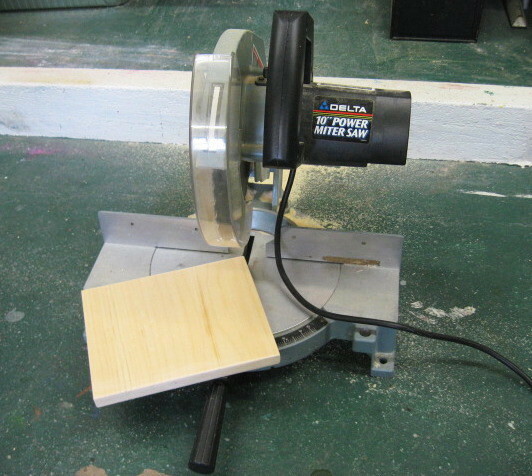 Then I took out the current block and made some changes. I cut out the reflection shape, and a piece at the top of the center bottle, which my color studies made me realize needed to go. I also used the opportunity (my hands were already pretty inky at this point) to clear out a lot of places that took unintended ink the previous time. I pulled two proofs, one on Rives Heavyweight, one on Okawara (the image above). I like the new version. I think that taking out those two pieces of black improves the balance, and the bottle on the left definitely pulls away from the frame. Molly gave her approval as well. After I cleaned up everything inky (palette, tools, hands) and took a brief lunch break, I decided to start color experiments on one of last week's proofs. (it lacks the changes made today, but this was just to play with colors) Working from my notes, I did what's seen above. Eventually I took it home to compare to my original sources. A lot of it is pretty accurate. 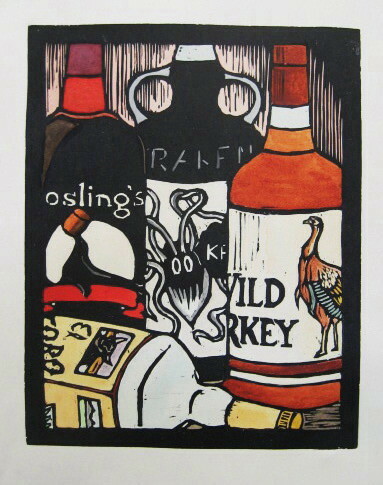 The neck of the bottle on the left is fine in the lower part (dark rum), but the top above will need to be more pink. The label on the middle bottle stands out for being so stark white- I may darken it a little in the final version, though today's proofs are both on warmer colored papers so it may not be an issue. The Wild Turkey bottle is fairly accurate, but I didn't need to take it home to realize that the whiskey color is way too bright and bold. It matches the color seen in many of the online photos, but I'm guessing those colors are the results of artificial lighting or some computer trickery. I compared it to actual whiskey I had around the house and I can definitely tone it down considerably. The tequila bottle matches my photo pretty well (came from an actual bottle I had and photographed), but I'll see how it balances after I make the other changes. It's pretty much an all warm palette, reminding me of the early color stage of many of my recent bigger prints (all yellows, reds, and browns), so that may inform my choices for the background colors. I'll try some new things tomorrow, and if they work, I'll try them on the new proofs later in the week.